Supporters of former Yemeni President Ali Abdullah Saleh attend a rally marking one year of the Saudi-led coalition, Sanaa, Yemen, March 26, 2016. (AP photo by Hani Mohammed). 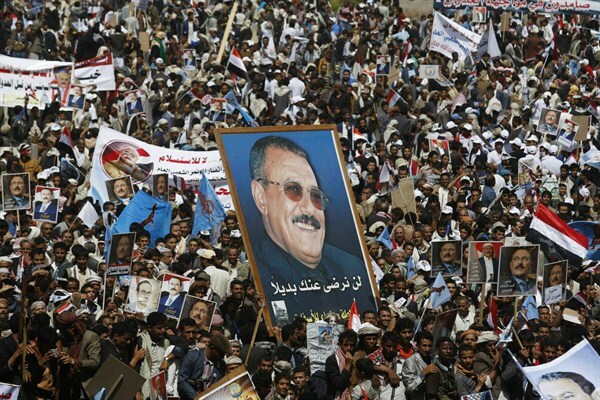 In March, to mark—and taunt—the two-year anniversary of the military intervention launched by Saudi Arabia in northern Yemen, former President Ali Abdullah Saleh marched down a major thoroughfare in the Yemeni capital, Sanaa, surrounded by throngs of adoring supporters. Bodyguards cleared his path as a crowd of tens of thousands cheered him on. The Sanaanis, as the capital’s residents are called, were overjoyed to catch sight of the man they consider their leader—even though he was forced to step down as president five years prior.